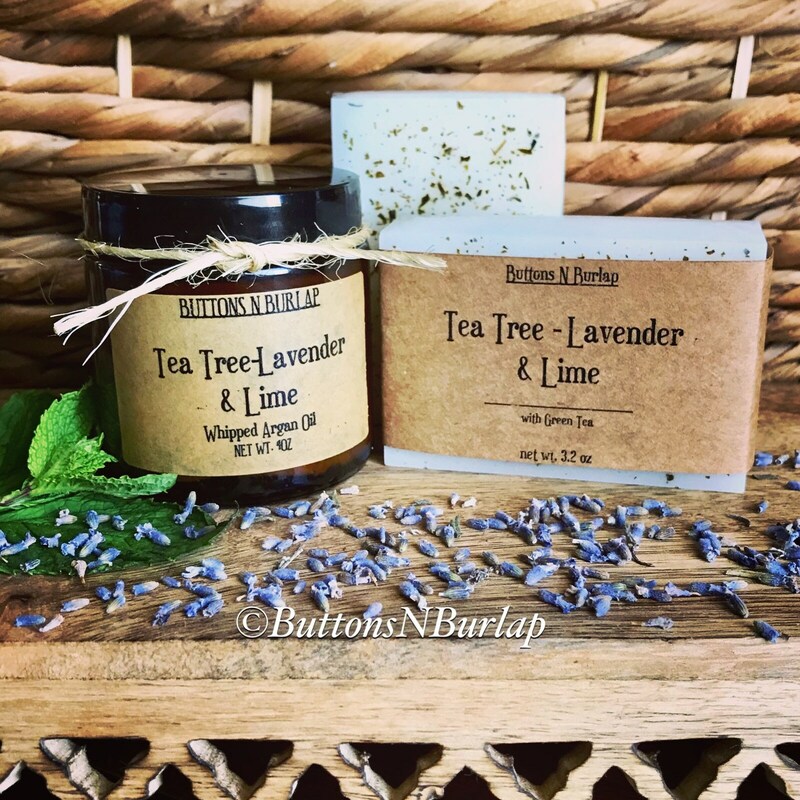 Tea Tree Oil and Lavender come together in this gift set to provide deep nourishment for dry skin, eczema, and acne! The scent is light and refreshing, it is sure to please! 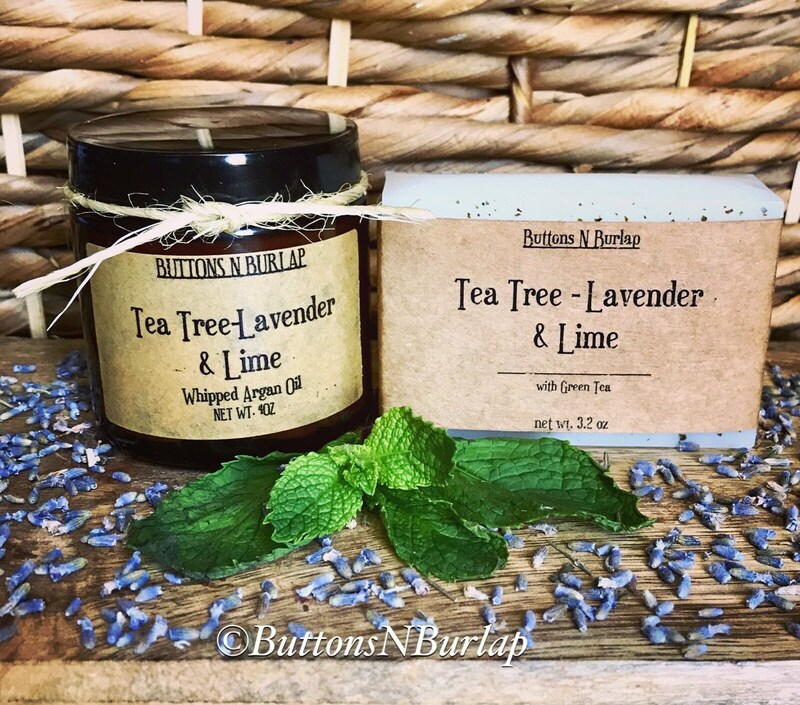 • LAVENDER– Soothing and healing for skin, including acne, burns, rashes, eczema, psoriasis and dermatitis. Helpful against skin inflammation, itching, rashes and wrinkles. • TEA TREE – Very popular for acne, dermatitis, eczema, inflammation and rashes. Good for healthy skin in general. This has antibacterial, antifungal and anti-inflammatory properties. • BERGAMOT (Lime)– Helps relieve stress, calming and uplifting. Good for acne, oily skin and eczema. Has anti-bacterial, anti-fungal and anti-inflammatory properties. • GREEN TEA- Helps tone your face by refining pores, protecting your skin with antioxidants, removing excess dirt and grime, and preparing your skin for hydration. ... also helps soothe your face, minimizes redness, and treats existing acne. The EGCG, a catechin present in green tea, helps get rid of acne. *Can be used on face and body!! *Always test any skin product on a small area first, to ensure no sensitivities.! ❗️Allergy Warning: People with skin sensitivities or allergies should first test the soap on a small spot of the skin and stop using it if any irritation occurs.